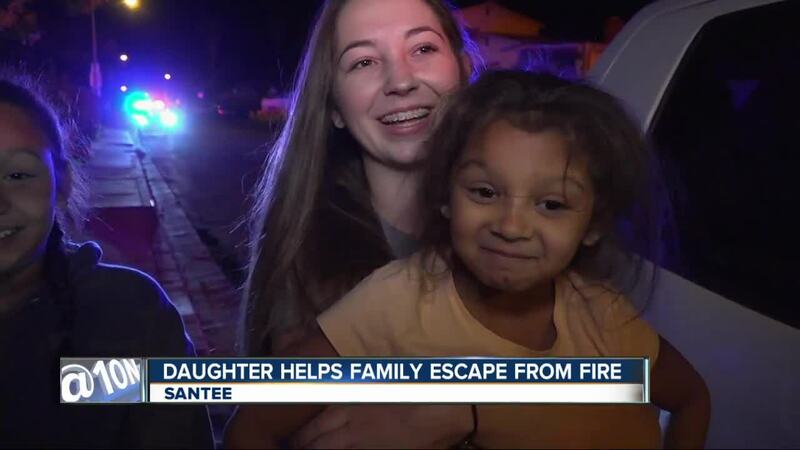 SANTEE, Calif. (KGTV) - A young girl is being hailed as a hero for helping her family get away from a fire that burned at their Santee home Friday morning. At about 3:45 a.m., firefighters responded to reports of two trees on fire in the front yard of a house in the 10300 block of Avanti Avenue. As the fire burned, a little girl heard what was going on and alerted everyone in her house to wake up and get out. Two homes suffered minor roof scorching, but crews were able to put out the fires before they caused any serious damage. A battalion chief told 10News the fires were believed to have been caused accidentally, but the incident remains under investigation.